Battlemage Armor Bugfix (for HF) Stay up-to-date with the newest version of DAI Mod Manager! Cole's Hats Bugfix Stay up-to-date with the newest version of DAI Mod Manager! DAO-style bob for Leliana You shouldn't need this if you already have the DAI Mod Manager installed. DOT ( damage over time ) can do critical damage. 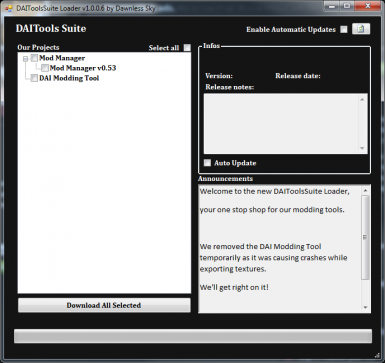 Use DAIModManager to load this mod. For the Qunari Latest version Needed to install this mod. Grey Warden Wedding Dress You need the mod manager, yo. Inquisition Battlemage Retextures Required to mod the game. This program used to be a client to download the latest version of the tools. I haven't worked on the tools for years now. I had started making a brand new version but with the coming of Frosty, there was no need for it. I have not worked on anything Dragon Age related in over a year and I will not ever again. Join it. There's tons of good people on there who can help you troubleshoot issues and get you started on modding DAI.